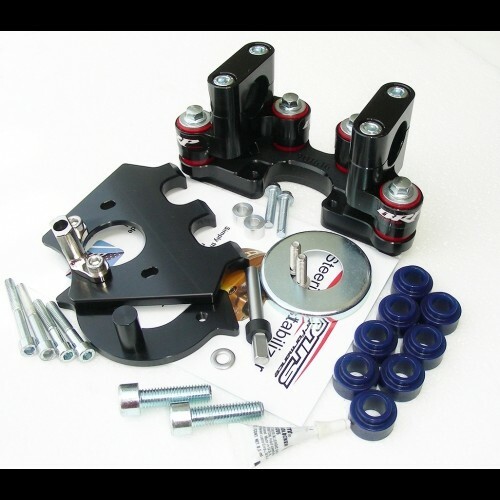 The kit includes everything except the Scotts steering stabilizer (RRP 031). By utilizing specially designed Poly-Urethane bushings we can offer a vibration dampening handlebar mount that will prevent arm pump and dramatically reduce rider fatigue. MED and SOFT bushings are provided. The frame bracket mounts around the stock ignition switch and blends in nicely with the white frame. All pieces are engineered for a clean fit. slight trimming of plastic shroud covering key area is required. The sub mount raises the bars 11mm and locates them between the #2 and #3 positions on the triple clamp.